Interest in Future Sci-Fi Sets? Re: Interest in Future Sci-Fi Sets? It would be great to get a sci-fi KS 100% compatible with the old resin style which was wonderful. May be something darker would be nice, something with an industrial look. I wonder if Stefan is willing to do it anyway. Sci-fi has nearly disappeared. Only few passage boxes left in the shop. 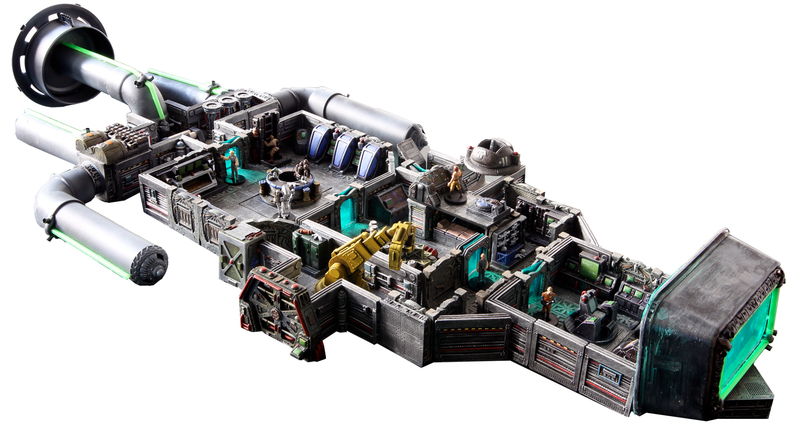 Resident Evil 2 gameboard KS with incredible miniatures is on the 25 and I think I will use DF 3D sci-fi old sets to make the underground labs and play with it. If someone knows other 3D sci-fi DFf compatible scenery, please let me know ! I was just looking at my Sci Fi sets today...thinking about how they'd be a good candidate for a kickstarter. I wonder if they would build off the current theme, or start with a new design. I had forgotten how fully fleshed out the Sci Fi line was and how much detail there was. Love to see what they could do with Dwarvenite. 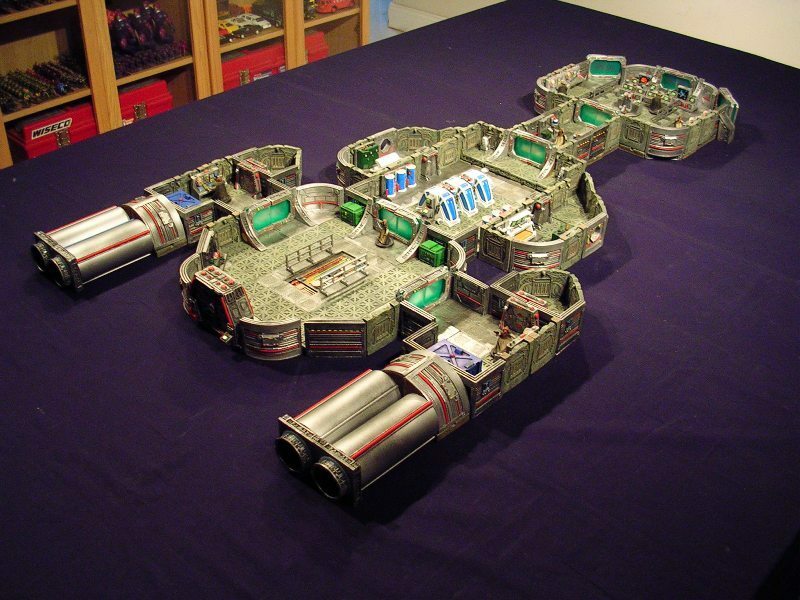 I would like a set, dwarvenite or otherwise, that i could use for a Traveller ship or station, or for a Starfinder game. star wars, the light freighter is about 35 meters long. thats about 10 2"x2" dungeon tiles across. thats the length of a traveller scout ship (which is smaller in width), but a free trader is about 13 tiles long, and 6 tiles wide (plus the fuel tank, which is more external walls). heck, the cargo bay alone is 35 floor tiles (7x5, PLUS walls). we need a large 'cargo bay' floor tile. the 'extras' of ship consoles and such would be nice, if broken up between engineering, command, and passenger compartments. probably a 'cargo' selection of crates and barrels as well, those would be high demand for other games too. I would be like a set if thee different center hub sections that were three-sided, five-sided, and five-sided for multispoked ships and stations. Also it would be good to have engine room, thrusters, air lock, a hangar door, and turrets plus if course re-reals of all the "current" DF SF sets. Wiglaf, you are a true necromancer. Long passages or hallways are needed. I considered a set of the maki sci fi corridors but after reading more decided against it. Re: Re:Interest in Future Sci-Fi Sets? What I would like to see in a future set ? I think 9x9 squares tile, a pack of long straight walls (2x6 squares), damaged straight walls, a lift door, a base entrance, straight walls with transparent windows. I agree with all of these, but especially bigger stand-alone floor pieces and long walls. An airlock would be useful also. Re:Interest in Future Sci-Fi Sets? I feel that there is little that is really needed aside from re-casting the older sets again, or making something with similar pieces if those molds are gone. I know I would invest rather heavily in such a re-release of those sets. Sadly, I was a penny pinching college student when they were last available. That is no longer the case. My order should arrive tomorrow. I look forward to posting pictures as soon as I get my first set up put together. Once I have evaluated how far I can stretch those sets I'll be checking the budget to see how much more I can afford. This is an exciting time. I can see combining the sci fi sets with caverns and the rumored sewer set to create some excellent Fallout 3 and New Vegas style setups. I am with you guys - i will sign up for a 10 pack of sci-fi plus 5-10 addons!. I have 5 rooms, 6 sets of corridors and a set of the large platforms/columns (no ramp though) and a set of accessories. Its enough to show off the set but not enough to reallly do something magnificent.